Everyday across the globe there are millions of events which take place. Some events are done on a small scale, where as others are done on a massive or large scale. In order for a event or ceremony to go off in an error free and successful manner, people hire event managers who oversee the entire planning and execution of the event. If it is your aim to become an event manager then you must be someone who is willing to work around the clock. This job pays well indeed, but it involves plenty of hard work as well. 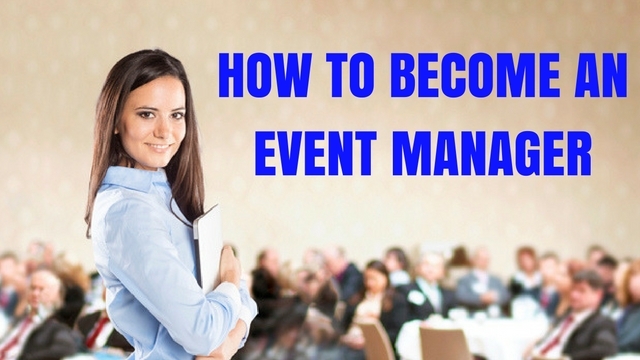 Given here are some of the best ways to help you become a event manger. The main role of the event manger is to ensure that the event is a success. If the event is not a successful one then it is primarily the fault of the event manger. If you wish to be a renowned event manager, then right from your first project you must ensure that you do a fabulous job. You cannot simply get up one fine morning and decide to be an event manager, to get recognized you should do a course in event management and this is something which will really be a learning experience for you. You can try to work in a company before you actually branch out and do things on your own. An event manager is someone who works in the background without expecting any recognition. Keep in mind that it is the role of the event manager to handle everything about the vent without actually being seen. On the day of the event you cannot be seen all over the place as someone who is the guest of honor. Before you enter this profession you must mentally prepare yourself of the fact that an event manager is someone who is never in the spot light. He is someone who works tirelessly behind the scenes. This is one of the chief things in an event manager’s job description. It is the role of the event manager to ensure that the needs of the clients are kept in mind at all points in time. It is up to him to recognize the needs of the clients and even understand the target audience for the event. He must speak out if he has something important to say or a suggestion to give. However an event manager never puts his preferences above that of the client. An event manager plays a manager role when it comes to the carrying out of any big event, but he must ensure that he does not let things get to him in any way. To be a good event manger you need to have a number of skills as well as qualities, however the most important one is that you need to be a very responsible individual. Even managers are people who always get things done no matter what. They never let their clients down, no matter what adverse circumstances happen to present themselves. Once they manage to bag a contract they cannot take things for granted at any point in time. Once you become an event manager there is no scope for making up excuses when things are not done in the proper way. Event managers are always people’s persons because they are expected to communicate with so many individuals on a daily basis. If they are not peoples persons then they will never be able to convince people to hire them and in addition to that they will never be able to take care of or manage the team which works for them. Being a people’s person is something which does not come easy to all of us. So if you are someone who is not very good at communicating then maybe this is not the profession for you. This is a quality of an event manager which is indispensible. Good event managers are those who are very good at following instructions, in addition to following instructions well they also have very good listening skills. When it comes to organizing an event an event manager must pay close attention to what it is that the clients want on the big day. However this does not mean that an event manger is someone who is meek and unable to speak up. A good event manager is a perfect blend of a good listener as well as a good leader. It is after all an event manager who takes control of so many people who work under him. To become a good event manager you need to be exceptional at multitasking. If you are someone who is not a good multitasker then maybe you should shy away from becoming an event manger. Good event managers have to look into a number of things and cannot afford to disregard certain aspects of the event. Even if you are not born with the quality and skill of multitasking, you can learn it over time. The more experience you gain, the better you will be at doing this as well. A good client is someone who is very sensitive. He instantly gets the vibe of whatever the client is trying to communicate. Even if the client is not one to communicate things in a coherent manner, an event manager should have the ability to understand things very quickly. If he is slow to gauge and comprehend things, then he will never be able to make it very far in the event management world. In this day and age no one likes people who are silly and constantly ask stupid questions, so if you wish to be an event manager ensure that you have a smart manner and disposition. As it has been mentioned above, an event manger is someone who knows how to multi task in a proper and efficient manner however along with knowing how to multitask, an event manger should always know how to manage time very well. A good event manager has the quality of time management. He never wastes his own time and at no point in time does he waste the time of others as well. He ensures that he gets the job done in time and in addition to that he also makes it a point to start the job well in advance. Doing the job in the nick of time is not good enough. Good event managers have a number of positive qualities however it is important that they are very systematic in what they do. They never assume that they will remember everything and that is why they constantly carry around their laptops, tabs or even their notebooks. This is something which is very admirable and it is a way in which event managers keep a track of everything. It is imperative that an event manager has the ability to handle pressure. If an event manager crumbles under pressure that nothing will go according to plan. Handling pressure is something which is not easy but if you wish to be successful manager, you must learn to keep all your nerves in check. Event managers need to be sure of themselves at all points in time. If they have no confidence in themselves then they will never be able to get others to acknowledge their own worth. For others to appreciate you, you need to learn to appreciate yourself first. An event manager has a number of duties as well as responsibilities. Of all the responsibilities which he has, one of the foremost is that he must always communicate effectively to both his clients as well as his teammates. If there is an error of communication then the event will not be a success. Hiring event managers does involve a lot of cost so you must make the client feel like he ask manager to get his moneys worth. This is a duty which is tough and challenging to carry out, but it is very important. The moment communication is not smooth, everything will crumble to the floor. It is the job of the event manager to ensure that all the money matters are being handled in a proper as well as effective manner. All events entail a lot of money so it is the duty of the manager to ensure that everything is tabulated in a proper manner. He should make sure that for all purchases which have been made there is a proper bill or receipt ready. At no point in time should there be any mis calculation of cheating or else the client will get a terrible impression of you. Be an honest worker and you will manage to attain a lot of success in the work of event management. The chief responsibility and duty of the event manager is that he must always be present to over see how everything is being carried out. He cannot simply show up on the day of the event. He must be seen days before the event getting this ready and even doing as many tests and trials as he can. If he is nowhere to be seen on the day of the event or prior then the client will surely get the idea that he is someone who does not even care about all the responsibility which has been entrusted to him. Keep in mind that if the event is not carried out properly it is not merely your client but also your hat will be getting a bad reputation. To become a better event manager it is imperative that you are always willing to go that extra mile. In this day and age there are plenty of event mangers who are just a click of button away. If you are unwilling to make the most of the opportunity which is given to you the first time, you will never be contacted by this client again in the future. So ensure that you outdo yourself at all points in time so that the clients are happy that they got in touch with you in the first place. If you deliver slipshod work, then that defeats the entire purpose of hiring a event manager in the first place. These are just the main things which can help you to become a successful event manager in today’s business world. You need not try to implement and execute everything which has been mentioned above, do whatever feels right and accurate for you on the given occasion. The secret for being a good event manager is that you need to be extremely attentive to the needs of your employer. Irrespective of how much of your time is being taken, you must ensure that everything is being carried out in a proper and smooth fashion. No one likes to hire event managers who are unsure of what to do and how to handle stressful situations when they happen to present themselves on or before the date of the event.